Stepaside Sheela, Co. Dublin, 12.8 km south of Dublin town (on the grounds of a golf course, in a secluded area between two rows of trees). Visited July 1999. This sheela was difficult to locate, as there are many golf courses in the Stepaside area. My parents and I finally found her by asking a grounds keeper on one of the courses. He recognized the photo immediately, and directed us to the right spot. Apparently when the farmland was turned into a golf course, they left a good deal of land around the sheela-na-gig untouched. I'd love to find out if this was because of superstition, or if the land around the figure was simply not appropriate for golfing. The figure is set in a secluded spot, in a well-maintained strip of land between two rows of trees. 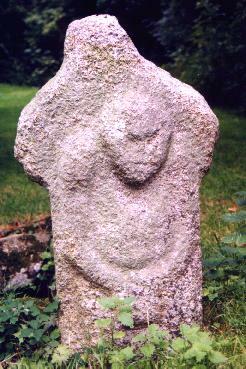 She is on a well-weathered stone which looks like it might have been in the shape of a cross at one point. The figure is broad and ape-like, with a prominent brow and wide, long arms. 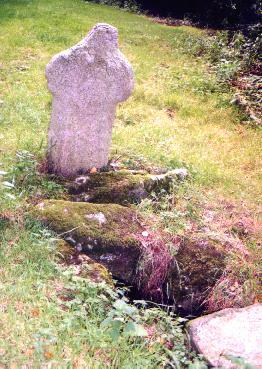 I'm including a shot of the reverse of the stone, because it looks like it marks the entrance to a grave or crypt. I have never read in any of the sheela books about a possible grave at this site. Next time I visit, I will try to contact the owners and ask why this site was preserved from development, and whether the site marks a grave.